The pin mold fungus Phycomyces blakesleeanus forms a dense forest of vertically growing fruiting bodies, but how does it know which way is "up"? New research publishing 24 April in the open access journal PLOS Biology, from Gregory Jedd's group at the Temasek Life Sciences Laboratory, National University of Singapore, reveals that the fungi have acquired and re-modelled a gene from bacteria to help them make large gravity-sensing crystals. 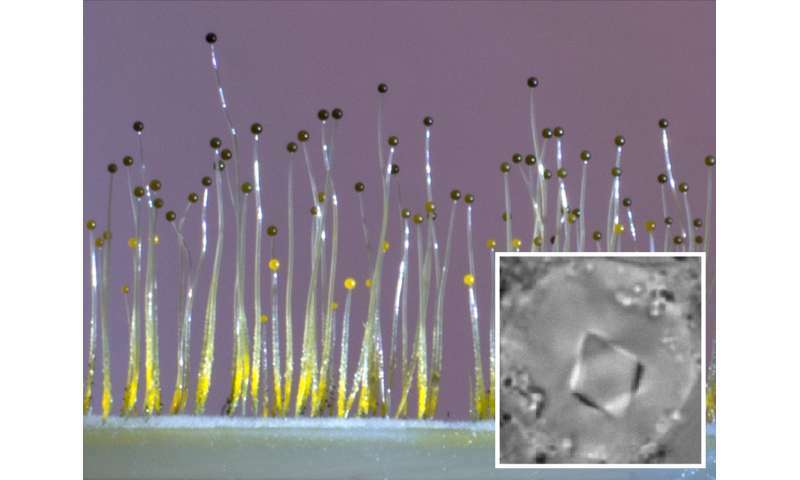 It was already known that the fruiting bodies of this fungus sense gravity and grow upright by detecting how octahedral protein crystals in fluid-filled chambers (vacuoles) settle under their own weight. But how the fungus acquired this trick during its evolution has remained unclear. To solve this puzzle, the team purified the crystals and identified a protein which they named OCTIN as their primary building block. Genetic information is generally transmitted vertically from parents to offspring. Horizontal gene transfer (HGT) is a phenomenon that occurs when DNA is transferred between unrelated individuals and can lead to the acquisition of useful functions such as resistance to environmental extremes and expanded metabolic capacity. In most well understood cases of HGT, however, it tends to be enzymes that confer these traits, and the original and acquired functions tend to remain closely related to each other. "We were surprised that OCTIN-related genes are found in bacteria and that all the evidence pointed to horizontal gene transfer from bacteria into the ancestor of Phycomyces," said the authors. "This was intriguing because estimates of sedimentation show that bacteria are too small to employ gravity sensing structures. This made it clear that we were looking at the emergence of an evolutionary novelty based on how the proteins assembled." In the case of OCTIN, the researchers noticed that the position of cysteine residues, which have the capacity to form molecular bonds within and between proteins, have become rearranged during the evolution of fungal OCTIN. Correspondingly, the fungal OCTIN crystals dramatically swell and dissolve upon the addition of chemical agents that break such bonds, indicating that they indeed play a critical role in holding the crystal lattice together. By contrast, bacterial OCTIN, which can also assemble into cysteine-bonded arrays, does so at a much smaller size scale (thousands of times smaller). However, this innate tendency to assemble suggests that bacterial OCTIN might have been predisposed to accumulating the mutations required to eventually build a crystal lattice. The authors note that OCTIN itself is not the end of the story; when they forced mammalian cell to make fungal OCTIN, it did not form crystals. This suggests that the fungus has co-factors that are required to assist crystal assembly. Dr Jedd adds, "We are currently searching for these factors with the aim of reconstituting OCTIN crystal formation in the test tube. This will allow us to better understand and manipulate the assembly process and its products. High-order assemblies like those formed by OCTIN are not uncommon in nature. Identifying and studying these types of proteins will not only reveal mechanisms of adaptation and evolution, but can also lead to engineered smart protein assemblies with applications in areas such as drug delivery and immune system modulation."